Yvonne is a certified personal trainer with over 13 years experience in the Corona/Riverside area. She has a Bachelor of Science in Biochemistry from UC Riverside and is active in the health and fitness industry. 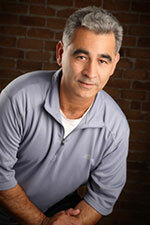 Frank is a certified trainer with over 20 years experience in the health and fitness industry. He specializes in sports and post-rehab training. He also teaches Tae Kwon Do and Judo to individuals and small groups. He has a Bachelor of Science in exercise physiology from Cal State Long Beach.